Behind the scenes of an upholstered chair. Ever wonder what’s beneath the fabric of an upholstered chair or couch? Those layers of horsehair, hand-tied coil spring, tacks, webbing, and foam are generally the internal makeup of upholstered pieces. All of those details equate to a whole lot of labor, meaning that reupholstering an existing piece often won’t be less expensive than purchasing a new one. Upholstery is worth the expense if you’re restoring a beloved piece or simply prefer the bones of antique or vintage furnishings. If you’re ready to pull the trigger on a furniture makeover, here’s what you need to know—from fabric to foam and trim—before you go. Jute webbing is used on the bottom and sides of the chair. Webbing holds up the coil springs on the seat. Coil springs are hand tied with an eight-way tie. Sinuous springs are used on the back of the chair. The chair’s back contains burlap, and then a piece of 1-inch medium soft foam with cotton and Dacron on top for padding. Cotton, wool and muslin can add shape to arms and chair backs. Using cotton and wool with muslin can also be used to shape an arm or chair back if you want to create an exaggerated curve. 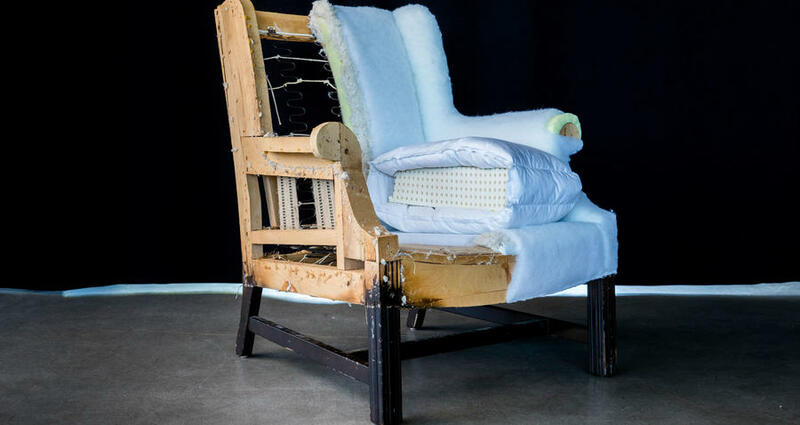 If you want to use eco-friendly products such as latex foam, cotton, wool, and muslin instead of polyurethane foam, Dacron, and decking, this is also something to discuss with your upholsterer. Horsehair, as well as latex-sprayed condensed horsehair, are available for re-upholstery. Traditional and eco-friendly options tend to be more expensive since the process takes longer and the materials are considerably more expensive. On top of the seat is half a cushion; it features polyurethane foam with a feather wrap. You can also opt for one of the following: polyurethane foam with a Dacron wrap; spring cushion with foam wrapped in either Dacron or feather wrap; latex foam with cotton and muslin; latex foam with a feather wrap; or 100 percent down and feather cushion. Density of foam ranges from super soft to extremely dense—soft being used for chair backs and dense for seats. Feather wrap provides a soft feeling, with some support coming from the foam or springs on the inside. An all-down and feather cushion is very comfortable but tends to compress easily. Spring cushions are quite durable, don’t break down easily, and have a very comfortable seat. Latex foam is durable and feels more squishy than regular foam; it is more expensive but not made with polyurethane so it produces less off-gassing. Lastly, outdoor foam is available for outdoor cushions. Water just runs through it, so there is no worry about mildew or mold in the cushions. If you’re shopping for an antique piece to reupholster, feel below the dust cloth on the bottom to check if there are coil springs. This means that it’s an older piece and very likely not mass manufactured. Then, pick it up. Is it heavy? This is an indication that it’s made with hard wood and features coil springs: both are elements of a quality piece of furniture. Upholsterers generally work with two types of fabrics: natural and synthetic. The former include cotton, velvet, linen, silk, wool, mohair, and leather. Synthetic fabric includes polyester, viscose, rayon, acetate, and vinyl. Natural fibers have a soft touch and fewer chemicals are used in the manufacturing process, but not necessarily in the dying or printing process. Cotton, linen, and silk are most likely to stain and stretch out and are very susceptible to fading and even tears. However, cotton and linen are easy to clean and launder compared to most upholstery fabrics. Velvet and mohair are very durable fabrics that are great for those who have cats. If you get a piece with velvet that has been patted down, try using a cloth and some steam to pop it back up. Synthetic fibers have come a long way since they were first made; they feel soft and look the same as natural fibers, but they tend to hold up better to stains, daily use, and fading by the sun. Indoor/outdoor fabrics such as Sunbrella are very popular right now, even in indoor furnishing because of their durability against children, pets, and sun fade. Trims are a great way to make your piece unique, even one you bought at a store. Most trims should fade into the furniture so the eye is attracted to the fabric or chair and not just the trim—unless you are trying for a particularly unique look. When working with an upholsterer on a piece that needs trim to cover the staples or tacks, you have a few options, including using the chair’s fabric to create a double welt cord. When ordering fabric for this treatment, be sure to order an extra yard since all welting needs to be cut on the bias or diagonal of the fabric. This look is modern, and always matches perfectly since it is the same fabric. It is attached using a glue gun. If you try to sew this at home, use a zipper foot and denim needle, which is a lot stronger on multiple layers of fabric. Another option is cord trim or gimps; they come in lots of colors. They are typically used on antique furniture and can be easily attached at home. This trim can be flat or more elaborate, and is also adhered with a glue gun. Most large fabric stores have a section for these types of trim. Also, single welt can be attached to the bottom of dining seats or on some furniture to give a framed look to a piece or a pop of color. For the ultimate finishing touch, consider nail heads in gold, bronze, or silver varieties and multiple sizes. Using them is definitely labor intensive, but they add a beautiful look to the right piece.